Jack Bauer (played by Kiefer Sutherland) wears a Casio G-Shock DW6600 in Season 2 of 24. Screenshot from Episode 11. 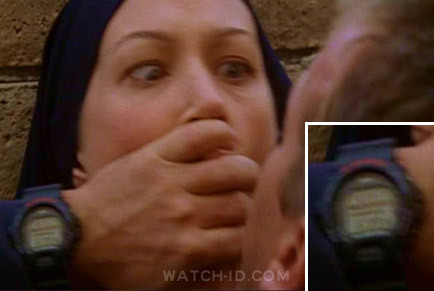 In Season 2 of the tv series 24, actor Kiefer Sutherland wears a Casio G-Shock DW6600. This classic Casio watch from the popular G-Shock range is loaded with features, including EL backlight with afterglow, 1/100 Sec. Stopwatch, 24 hour countdown timer and Resin band. Some of the new DW6600 watches have the words "Electro Luminescence" in stead of the word "Illuminator" above the light button (see image on the left) but the version with "Illuminator" is also available, for example here . The same watch can also be seen in the film The Italian Job, where it is worn by Seth Green. Casio launched two special CTU editions, in honour of the series 24. CTU is the Counter Terrorist Unit, for which Jack Bauer works in the series 24. The first edition was a Casio G-Shock DW-5600VT CTU. A CTU and 24 logo are printed on the band, "Jack Bauer" becomes readable on the face in the EL backlight and the back is engraved with the CTU shield. The watch came in a CTU and 24 branded case. Read an interesting review here. 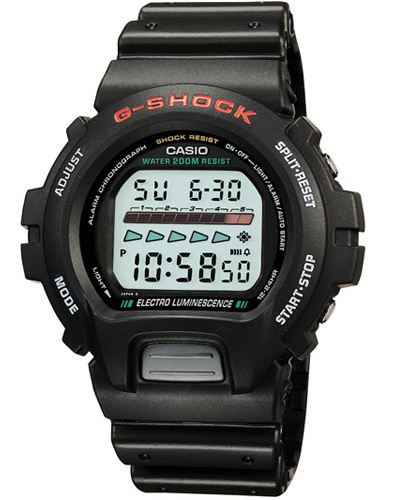 The second special edition was a Casio G-Shock DW6900, which looks more like the DW6600 worn in Season 2. A CTU and 24 logo are printed on the band and the face, "CTU Agent" becomes readable on the face in the EL backlight and the back is engraved with the CTU shield. The watch came in a CTU and 24 branded case. Both of these special editions never appeared in the series, but are collectors items nonetheless.